The Leverhulme Trust funded a year’s artist-in-residence fellowship for Elpida in the Department of English, King’s College London (a ground-breaking award). The principal aim of the residency was the production of a series of twelve large-scale oil works based on key psychological moments in the plays of Shakespeare and offering challenging new perspectives on those moments. Elpida has sought, in particular to represent the psychological models Shakespeare himself drew upon. Finding negotiation between those models and contemporary psychoanalytic perspectives has been challenging. Shakespeare has always provided a rich source of thematic inspiration for artists; Elpida Georgiou’s work explores the conjunction between Shakespeare and psychoanalysis with a challenging immediacy, sailing a stormy sea of interpretation. From Galenic philosophy through Freud’s debt to Shakespeare and on to the Lacanian politics of Lear’s madness, she allegorises ancient, early-modern and post-Freudian models to confront key Shakespearean concerns for the twenty first century audience. Ms Georgiou’s ambitious project is a direct result of what has shaped and influenced her own artistic development; as an art student she paid close attention to twentieth century psychoanalytic models of human character and behaviour. Elpida seeks through her paintings to interpret Shakespearean psychologies through a postmodern visual language of appropriation and allusion. Such ideas were the starting points for this series of paintings which transcend approaches based on the representation of specific scenes and seek the heart of Shakespeare’s dramatic achievement. Psychoanalysis has been indebted to Shakespeare from the beginning: Freud was as dependent upon Shakespearean archetypes as he was on Classical; and Jung similarly drew upon the mythic power of the plays in his approach to the intersection of psychoanalysis and aesthetics. And it is to the conjunction of Shakespeare and psychoanalysis that Elpida is drawn as the thematic underpinning of a major series of these works, combining ancient, early modern and post-Freudian models of human nature to confront such key Shakespearean concerns as melancholy, depression, madness, narcissism, jealousy, child-parent relationships, the consequences of an absent parent, and the roots of violence. Freud suggested a rapport between Shakespeare’s unconscious and those of his tragic heroes, concentrating on Hamlet while developing his theory of the Oedipal complex. He went on to claim that this unconscious complicity extended to the theatrical audience and the reader. Influential as his arguments have been, however, Freud never held a monopoly on psychoanalytic criticism and more recent generations have approached texts from a wider range of perspectives. None supplies an all-comprehending truth, but many may be of heuristic value. 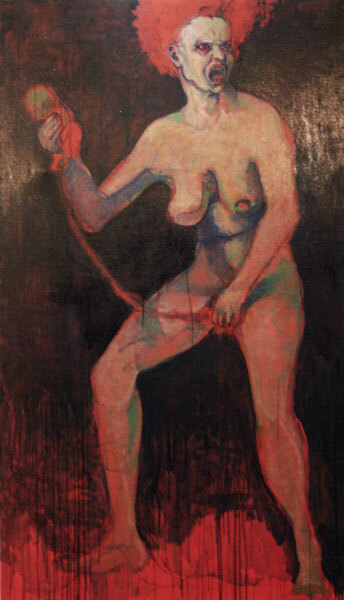 Drawing on the work of such influential writers in the Freudian tradition as Jacques Lacan, Melanie Klein and D.W. Winnicott and psychoanalytic critics like Norman Holland, as well as on Freud and Jung themselves, Elpida will seek through her paintings to interpret Shakespearean psychologies through a postmodern visual language of appropriation and allusion. The Jungian world of The Tempest, the narcissism of Othello, the Lacanian politics of Lear’s madness: such ideas were the starting points for a series of paintings which will transcend approaches based on the representation of specific scenes and seek the heart of Shakespeare’s dramatic achievement. The artist and a representative from King’s English department are available for comment. Images from the exhibition are available on request. Please contact Antonella Surdi on 0207 848 5377.